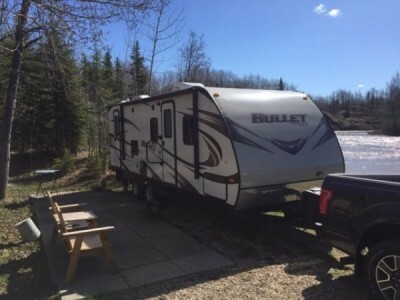 2014 Keystone Bullet 247BHS Trailer. Ultra light 26ft with bunks. Beautiful trailer. Shows like new. Buying house and need to sell. Will pay 1500$ cash to someone qualified to take over payments @ 146 bi weekly. Bought new at mcgoverns. Extra battery, thermo package. Power awning and jack. Extended warranty and protection package. Comes with generator. Call or text for further details 780-882-3770. 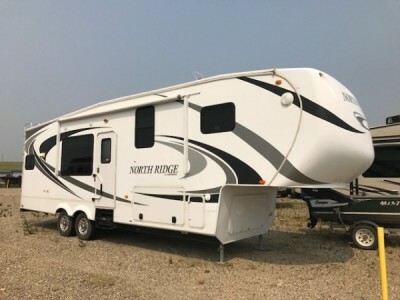 2011 Coachmen North Ridge 290RKD Fifthwheel. Excellent condition. See pictures for layout and colours. Onan Marquis Gold 5.5k LP Generator. Air Conditioner (13,500 BTU) - Bedroom. Generator Prep. Electric Fireplace. White Exterior Color. Booth Dinette. North Ridge Interior Decor. Slide Awning Package. LCD TV (19-Inch) in Bedroom. Dual Recliners (IPO Shaped Sofa). Power Vent Fan. North Ridge Full-Body Exterior Color. Excellent Condition. Ready to roll turn the key and go. Please call 403-348-7307 to view. 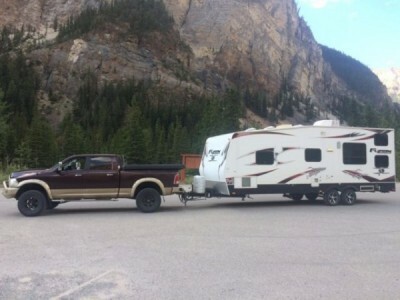 2011 Keystone Fuzion 260 Toy Hauler. Not too big and not too small , very versatile unit. Hard wall gel coat siding and rubber roof. Inside and outside stereo with subwoofer and auxiliary ports, 32in sony TV, A/C, furnace, built in generator 4000 watt Cummins Onan that can be started from inside unit. 100L fuel tank with pump station for toys. Electric awning. Tinted windows keeps cool in summer. Tie downs for toys are anchored right to frame. If interested please call or text (780) 402-4033 to view. 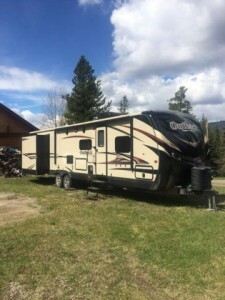 2007 Okanagan 32-5V Fifthwheel. 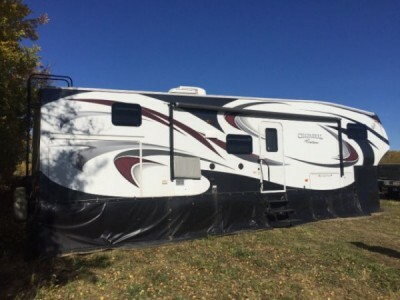 Excellent condition, 3 slides aprox 400 sq ft, queen bed, large closet, queen hidabed, kitchen island, dining table with 4 chairs, recliner, TV & remote satellite system. Non smoking, no pets. In Pincher Creek Alberta. Please call 403-627-2106 to view. 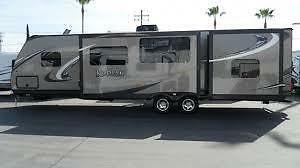 2012 Coachmen Chaparral 279BHS Fifthwheel. 35ft long with bunk house and outdoor kitchen! Maple Leaf Edition with great looking decal package! Sleeps 9 people! 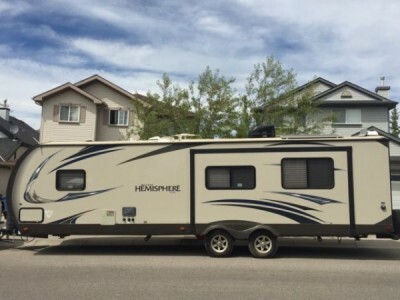 Compare this with a brand new RV - save $12000-$15000, Lots of great features, 2 slides, the dining room table and couch on one slide out creates huge open space in the living area, bunk house in rear with 3 bunks and storage, send the kids to bed and not worry about waking them, large master bedroom with full queen size bed, armoire slides out to create more space, large shower in the bathroom, TV and built in speaker system, Outdoor kitchen with grill and fridge, power awning, power front levelling jacks, lots of storage The Maple Leaf package includes upgraded insulation throughout! Also included is an insulated skirt. Great for fall camping - takes 20 mins to put up, and only 10 mins to take down. Comes with a king pin jack ($300) to help stabilize the front once set up. Compare this with the same brand new unit and look to save $$$! 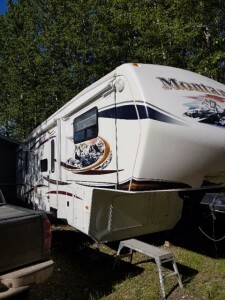 Purchased new from Woodys RV in Edmonton. Only 1 owner. Get ready for summer and RV in style! Please call 780-554-8691 to view. 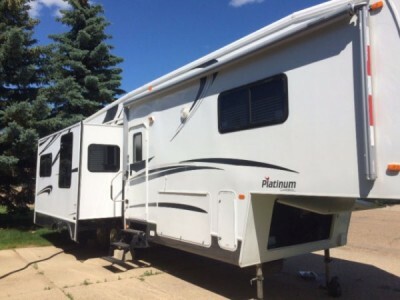 2011 Keystone Montana 3750FL Fifthwheel. 39ft Front LR, 5 Slides with toppers, King Bed, Large cedar lined closet, 4 door fridge, table and 4 chairs, 5th chair for desk, Corian counters, 3 burner stove with oven, convection/microwave oven, wrap around sofa and double air bed sofa, 2 TVs, 2 A/Cs, auto satellite system mounted on roof, fireplace, entertainment system, 3 year transferable extended warranty, washer/dryer optional and more. Please call 780-940-7061 to view. 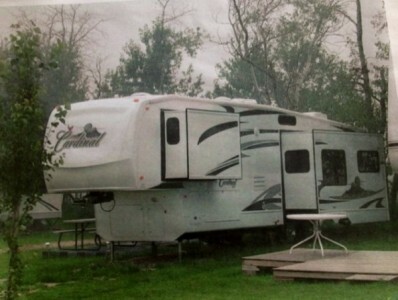 2013 Rockwood Wind Jammer 3006WK Trailer. Gently used v-nose trailer for sale. 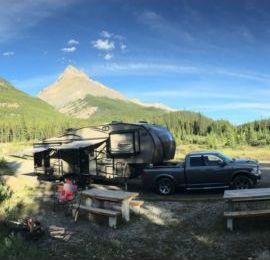 2 slides, sleeps 9, power awning/stabilizers, light weight, fully loaded! Comes with dishes and mat, outside kitchen. Great family adventures await! Please call 780-914-9633 to view. 2002 Monaco Safari 40Ft Class-A Motorhome. 40ft 350hp Cummins, 7500watt Oman quiet diesel Onboard Generator. Heated under carriage, large water and sewer tank. Privacy glass, double slide in the main area. Fold down couch, bedroom slide with vanity and sink in bedroom, hook ups for washer/dryer, big bathroom and tub. Dual fridge and freezer,lots of cupboards and storage. Low miles. 41,000. No issues. 6-speed Allison Trans. Lots of power and very cheap on fuel. Average 10 miles/gal. Please call 306-460-4778 to view. 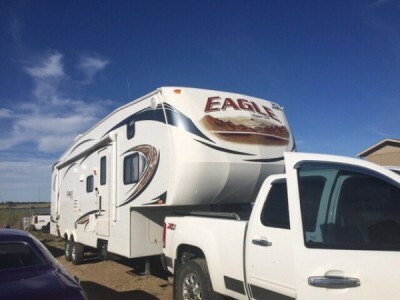 2012 Jayco Eagle Superlite 315FBH Fifthwheel. 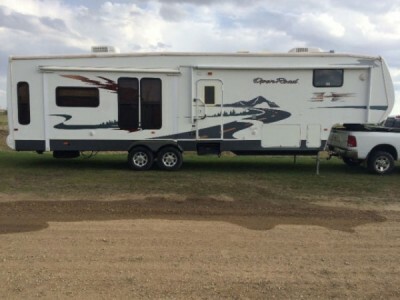 This fifth wheel is a must see, in excellent condition, low km, hardly used. 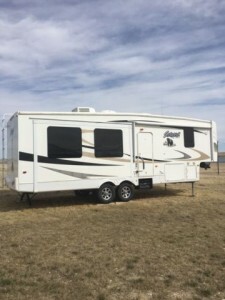 With four bunks over the fifth wheel hitch and a great master bedroom with a queen bed in the back that slides out this trailer is very spacious. The dining and sitting area slide out and the dinette and couch turn into double sleeping arrangements making room for ten people total in the trailer comfortably. The kitchen has great cabinet space and boasts high ceilings. Trailer has several options including the winter package and rear storage rack. 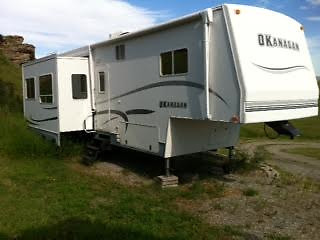 Trailer is well equipped with dishes, bedding, etc and will sell as a complete package. Glass shower door. Porcelain toilet with foot flush View Feature. 3-burner range with 9,000-BTU SuperBurner and piezo igniter. 6-cu. ft. Norcold refrigerator. Raised-panel refrigerator front. 312 coil innerspring mattress. Deep storage drawers under booth dinette. Dream Dinette table mechanism (select models). 32" LCD HDTV in living area View Feature. Ball bearing drawer guides 50-lb. capacity with full-drawer extension View Feature. Cable and satellite TV prepped. Raised-panel cabinet doors throughout View Feature. Crank-up HDTV antenna with signal booster. Pleated night shades. Soft goods designed and made by Jayco. Swivel rocker(s) (select models). Lumbercore pre-drilled and screwed cabinet construction. A/C Chillgrille. Please call 780-227-1659 to view. 2010 Cochmen Freelander 30QB Class-A Motorhome. 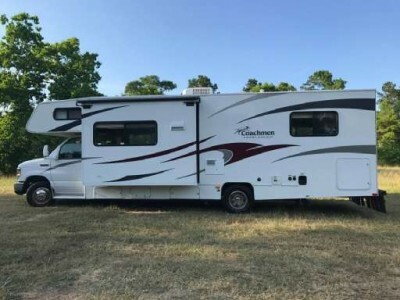 V10 Ford Engine on a Ford Chassis, 1 Slide-out, Onan Gas Generator, 1 Ducted Air Conditioner, Double Door Gas/110V Domestic Refrigerator, Automatic Main Awning, Backup Camera, Outside Entertainment System, TV, Microwave, 3 Burner Range, Well Taken Care of RV. Ready to Hit the Road. kitchen supplies come with excellent condition. Please call 780-832-7335 to view. 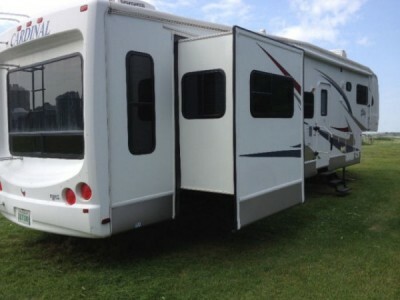 2007 Coachmen Mirada 300QB Class-A Motorhome. The Coachmen Mirada Class A "brings MORE to the road." The Mirada makes RVing in a Class A Motorhome enjoyable, enviable and affordable! Why not RV in the comfort and prestige of a Class A Motorhome? Coachmen makes this dream possible in our Mirada Class A Motorhome. 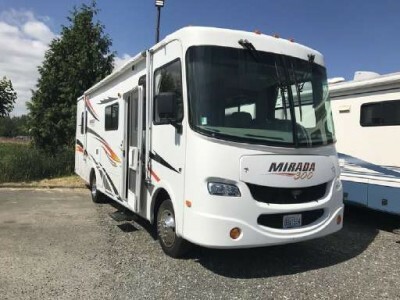 Whether you are a "first time" motorhome buyer or an experienced "motorhome enthusiast," the Mirada is designed to delight you with practical and usable floorplan designs, great eye appeal and the practical innovations and features that any experienced motorhome user appreciates. Please call 780-608-0975 to view. 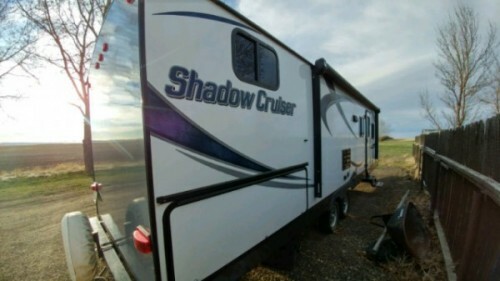 2015 Cruiser RV Shadow Cruiser 28QBS Trailer. Only used a few times. Comes with extended warranty.7 beds. Fully loaded winter package. Stocked with everything you need. Pots pans dishes bedding. Add food an water an ready to go. Moving to vancouver island must go. Please call 403-647-4406 to view. 2013 Dutchmen Kodiak Trailer. The only reason for selling is the kids do not come camping anymore and looking to down size. It measures at 33ft of living space and 37ft from bumper to tongue and has 3 slides. This trailer is mint and only 1 owner it has a solar panel package and is wired and comes with a 1500 watt inverter. The axles are flipped and it has 5000 lb castors on the back of the trailer so it will not dragged on the ground. Comes with 2 30lb propane tanks and has very little kms on it, mostly sat in the same spot all its life. This trailer weighs in at just 7500 lbs dry weight. It has a power front tongue jack, outside speakers, enclosed underbelly, outside fridge and TV hook ups. Please call 403-634-1447 to view. 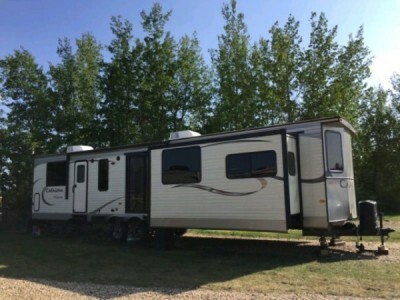 2014 Forest River Salem Hemisphere 202RK Trailer. Beautiful and Spacious, Offers all of the Convenient Features a vacationing Family would want. This Salem Hemisphere 282RK features a Gorgeous Front Master Bedroom with lots of storage space. It has a Full-Size Wardrobe with Drawers, Nightstand with Mirrored Closet Above on one side of the bed and a Full Mirrored Closet on the other side of the bed, and Queen Bed with Overhead Storage. The Side Aisle Bath includes a Full Size Neo-Angle Shower, Large Linen Closet, Sink with Medicine Cabinet Above and Cabinet Below, and Toilet. Moving to the Center Living Area, you will be greeted by a Large Super Slide holding the Table & Chairs and the Hide-A-Bed Sofa. This Slide-Out allows for more Space to Relax or Entertain in a Comfortable Atmosphere. There are also 2 Recliner Chairs with an End Table between for extra seating. And Finally, at the Rear of this Salem Hemisphere 282RK is the Intuitively Designed Residential Style Kitchen. This Kitchen offers Plenty of Counter Space and Storage Cabinets and Drawers. It includes a Double Kitchen Sink, Double Door Refrigerator, Microwave, 3-Burner Range, and a large Pantry. Cooking is a Simple Affair in this Fully Equipped Kitchen. With so much to see, you do not want to miss checking out. This Salem is Tastefully Decorated with Modern Decor and Cutting Edge Looks and will surely be Envied by Everyone. You will be thrilled with all of its Dazzling Features! FEATURES: Flat Screen TV w/ DVD Player. One Touch Electric Awning. Enclosed & Heated Underbelly. Full Extension Ball Bearing Drawer. Stainless Steel Kitchen Package. Radial Tires Filled w/ Nitrogen. XL Grab Handle. 2 Exterior Speakers. Stabilizer Jacks (4). Pleated Night Shades. Aluminum Wheels. Black Tank Flush. Tinted Safety Glass Windows. Air Hide-A-Bed Sofa w/ Drawer. Skylight in Bathroom. Spare Tire & Carrier. Extra Large Double Door RV Refrigerator. Free Standing Dinette. 15,000 A/C, Ducted. (2) La-Z-Boy Recliners. Solid Surface Sink Covers & Undermount Sink. High Rise Faucet w/ Pull-Out Sprayer. Touch Screen Remote. Power Stab Jacks & Power Tongue Jack. If interested, Please call 403-901-7544 to view. 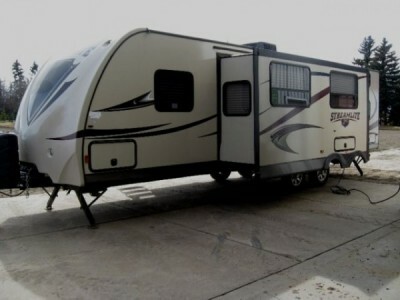 2006 Carriage Cameo LXi 27RKS Fifthwheel. 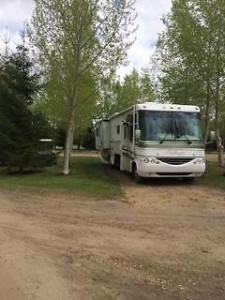 2 TV, fully equipped, 2 solar panels, bell satellite dish, barbecue, all season pkg, 2 slides, automatic awning. Please call 403-502-5092 to view. 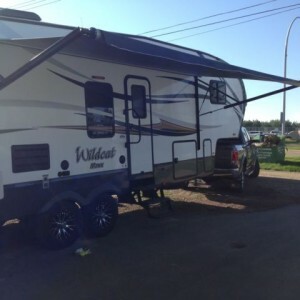 2014 Forest River Wildcat Maxx 262RGX Fifthwheel. One owner, immaculate condition. Very little use, low towing mileage. (under 5000km). 31ft with bumper, 2 slides with slide-out awnings, 18ft awning, 16in wheels, original tires that have been covered while not in use. 30000btu furnace, sealed and heated belly, 15000btu roof air conditioning, 4 season package, 6gal DSI hot water tank. Fantastic fan in bathroom, max air vents over all vents. LED lighting throughout trailer. Stainless fridge, stove, microwave, taps. Electric jacks front and rear. Big pass through storage with slam latches. Large storage under hitch area as well. Rack on back of trailer is great for bikes, generator, or any thing you want to strap down. Leather couch and dining room benches. Queen RV bed up front, fold out couch with air mattress and electric pump, table also folds down for bed. Flat screen HDMI TV, DVD, CD, tuner, bluetooth, aux inputs, outside speakers. Big battery box that was put in when bought will hold two big 6V batteries, battery disconnect beside battery box. Need to upgrade, family has grown with another child. No lowball offers will be accepted, not interested in trades. New trailer of this model is close to 60K same option package. More pictures are available. Please call 403-348-1141 to view. 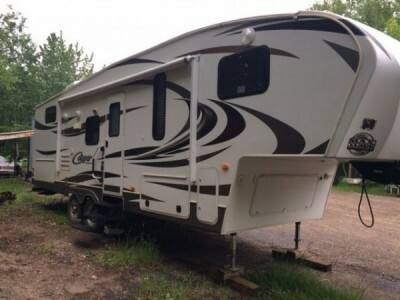 2009 Cedar Creek Silverback 30WRE Fifthwheel. Triple slide, A/C, entertainment centre with TV, solar panel, dual propane tanks, tons of storage. Trailer has been very well maintained and rarely used. Must be seen!! Please call 403-603-8488 if interested. 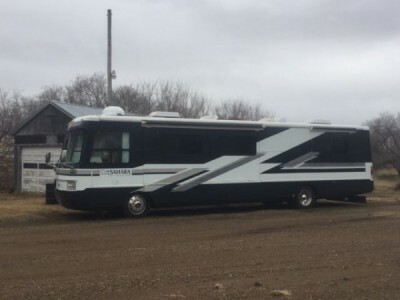 2014 Agusta RV Flex AF29RL Fifthwheel. 29 ft long. 10,800lb dry weight, 60gal fresh water, 20gal grey water, 20gal black water. 2x 30lb propane bottles. Roof A/C. Ducted heating and AC. Heated belly storage. Full queen bed, complete with new mattress. Aluminum foil backed insulation, vertical framing 16inch on center. Power rear jacks, power awning. 2 leather recliner chairs, 42 inch flat screen TV, electric forced air fireplace. Full sized shower. Inside/outside stereo sound system. Automatic powered roof vent with rain sensor. Wired trailer hitch. Excellent vehicle. Only used for towing RV. Please call 780-984-3656 to view. 2015 Keystone Outback 322BH Trailer. Please call 780-817-1842 for more information. 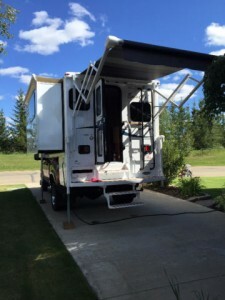 2015 Keystone Premier 29BHPR trailer. Mint condition, still winterized from last yr, towed less than 1000k ever. Still new trailer smell! Need to downsize, kids no longer camp with us. Towed with my F-150 ecoboost no prob. Willing to negotiate for a camping van. Please call 780-781-5613 to view. 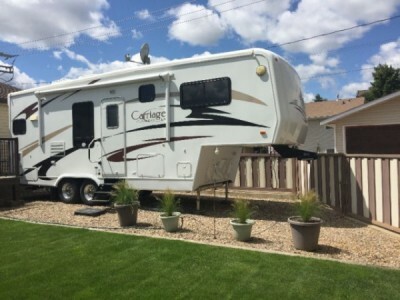 2014 Eagle Cap 995 Camper. 11.5ft. For Long Box Truck. Nice condition. 1 slide, Queen Bed, Dinette makes up to Double bed, Dry Bath, 47 Gallon fresh water tank, Micro wave, Good storage for a camper. Please call 403-506-2994 to view. 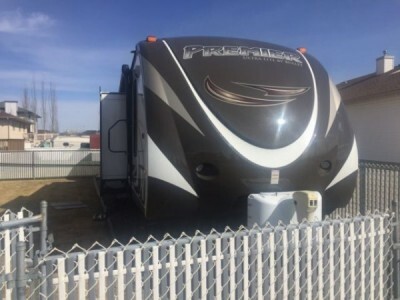 2015 Coachmen Catalina Destination 39MKTS Trailer. All the features of a home away from home. 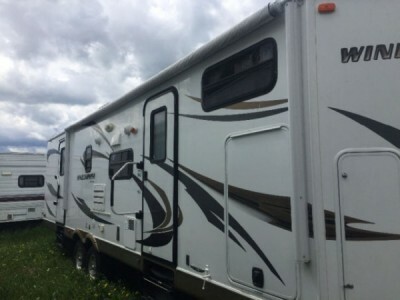 Including 2 roof air conditioners, full size stainless fridge, larger oven, fire place, king bed, large shower, lots of Windows including patio doors, electric awning, and camper will be mostly be stocked with everything you need to start camping. Camper was only used last year. It's currently in storage in Westlock. Please call 780-598-0687 to view.